Look what just came in the mail today. 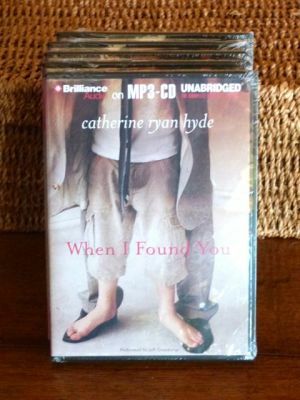 Five copies of the brand new unabridged audio edition of When I Found You. Not yet released. If you follow this blog regularly, you'll know that I like to keep two copies of every edition in my archive. Send me more than that, and I host a giveaway. So here goes. Three of these are up for grabs. Leave a comment below if you'd like to win one, and you're entered. I'll leave this open until about the middle of October. Then I'll draw three names. As always, enter your name in the "author" field of the comment form, not mine. (It means author of the comment.) Do leave your email address in the form, where it won't show publicly. I don't keep a mailing list, and I will use it only to notify you if you win, not for any other purpose. Don't leave it in the body of the comment, because then it will show publicly. And that's it! Good luck, and pass it on. I'm going to be away on a hiking trip the week of the 14th-18th, so I'm going to extend this giveaway by a few days, which seems fairer than cutting it short. So if you're wondering why it's mid-month and I haven't chosen winners yet, thank you for your little extra bit of patience. Check back on the 19th. I'll have names. Okay, this is where I have to stop and tell you that I hate this part. I look at all the great comments from the people whose names I didn't pull, and I wish I had thirty of these. But I don't. I have three. To those who left great comments but didn't win, as always, keep an eye on this blog. There's always more to give away down the road.